If there was every the perfect blend of beauty + performance in a product, it would be this Fresh Rose Deep Hydration Facial Toner. 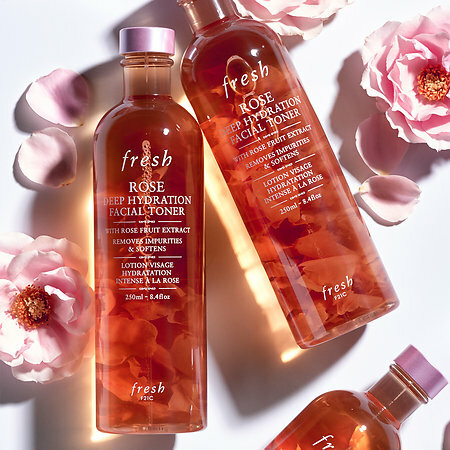 Not only is it the perfect product for those who love rose and rose-scented beauty, but it's also an excellent toner you'll reach for all summer. 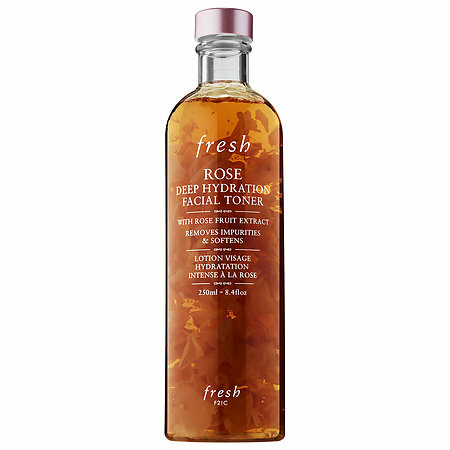 Fresh Rose Deep Hydration Facial Toner is infused with real rose petals and has a gentle formula that clears pores, cleanses and leaves skin feeling refreshed. In addition to the rose petals, it also contains rosewater and rose flower oil which help sooth and nourish skin. For those looking for extra hydration, it also had hyaluronic acid which keeps skin moist and gives it a glowing finish. To use the Fresh Rose Deep Hydration Facial Toner, I added a capful into my hands and massaged in into my skin, or I would sweep over my face with a large cotton pad. On very hot days I would also toss it in the refrigerator and use it cold for an extra refreshing sensation. I have to admit I was also drawn to the pretty bottle and floating petal effect of the Fresh Rose Deep Hydration Facial Toner. This would make a unique beauty gift for the beauty lover in your life who is a rose fan.